A Seam is defined as a line where two or more fabrics (or other sheet material) are joined together by means of stitches. For example, a superimposed seam – when two plies, one placed above another and is sewn together. A Stitch is defined as the configuration of the interlacing of sewing thread in a specific repeated unit. 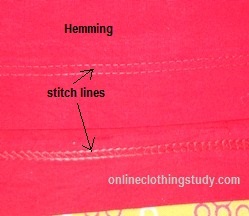 A stitch can be defined as a formation of thread for the purpose of making a seam or stitching. Stitch is made to join two or multiple fabric or other sheet together. For example, Lock stitch, overedge or overlock stitches. See right side images for example. Stitches are classified based on structure and stitch formation. Normally stitches are classified as below.